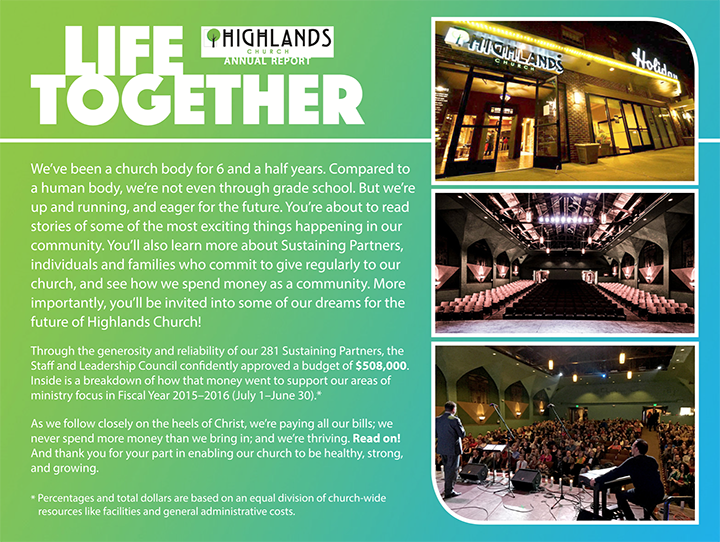 This is an end-of-year financial report I did for Highlands Church, a thriving seven-year-old congregation that meet in northwest Denver. 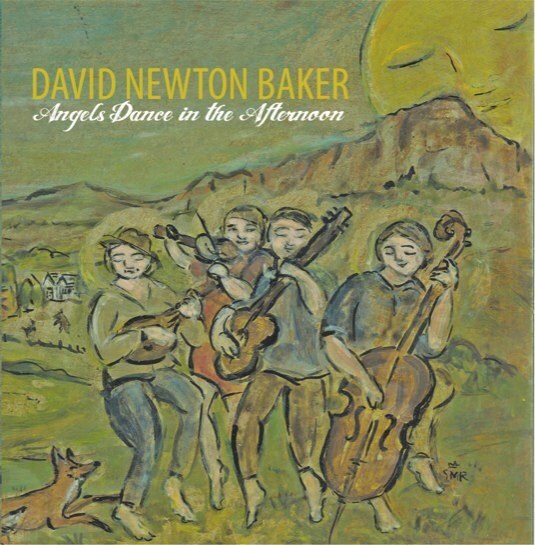 David Newton Baker is a Colorado musician who approached me to design his latest CD materials. I pulled together the art, fonts, color palette and did the layout, as well. 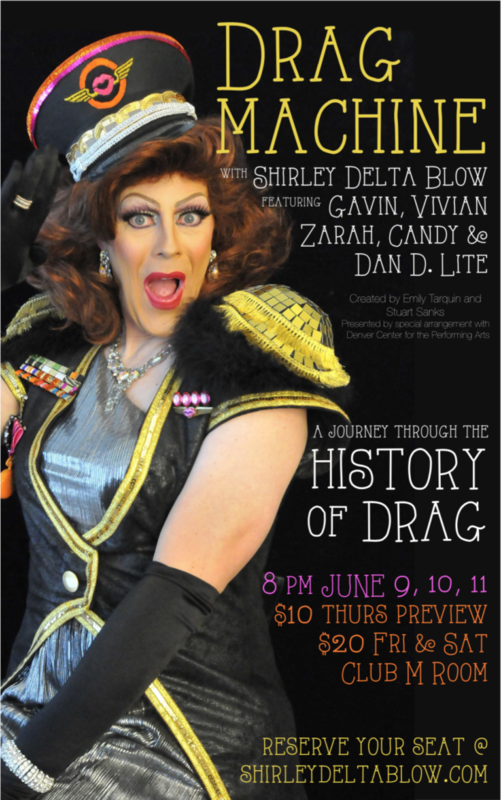 Here are various posters, flyers, post cards and digital elements for local concerts, shows and theater performances. Andie and Laurie’s wedding had a “belle epoque” theme. They even asked guests to dress from the early 1900’s era. 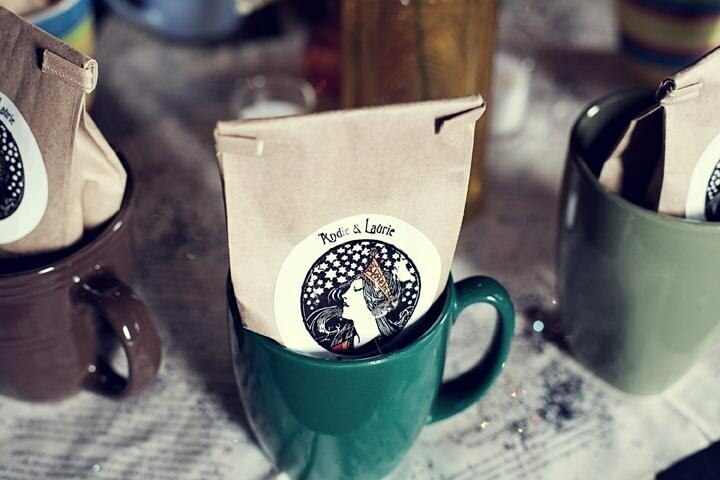 I used Art’s & Crafts fonts and early Art Deco graphics to continue the theme in the printed pieces. There was intentionally little color used, but the blank envelopes matched the jewel-toned palette of topaz, ruby and amethyst. I've done most of the design and layout of programs, flyers, posters, signage, banners, apparel, etc. 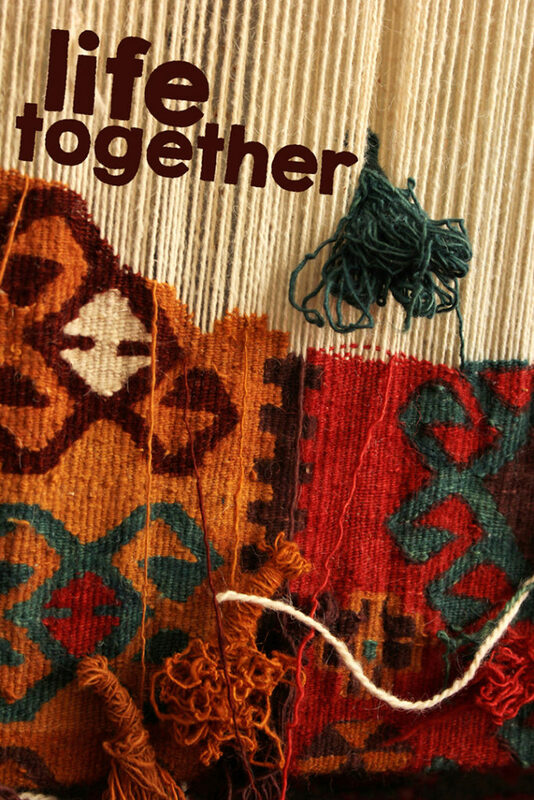 for Highlands Church in Denver. Here are a few examples. Rush Hour is the children’s program for Rocky Mountain Christian Church. It is a large production they put on weekly that requires a permanent set. 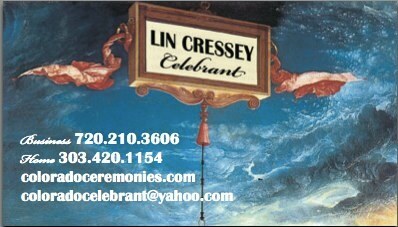 I was hired to do the backdrop for the set, as well as banners in the lobby and auditorium. I created all of these pieces in Adobe Illustrator. 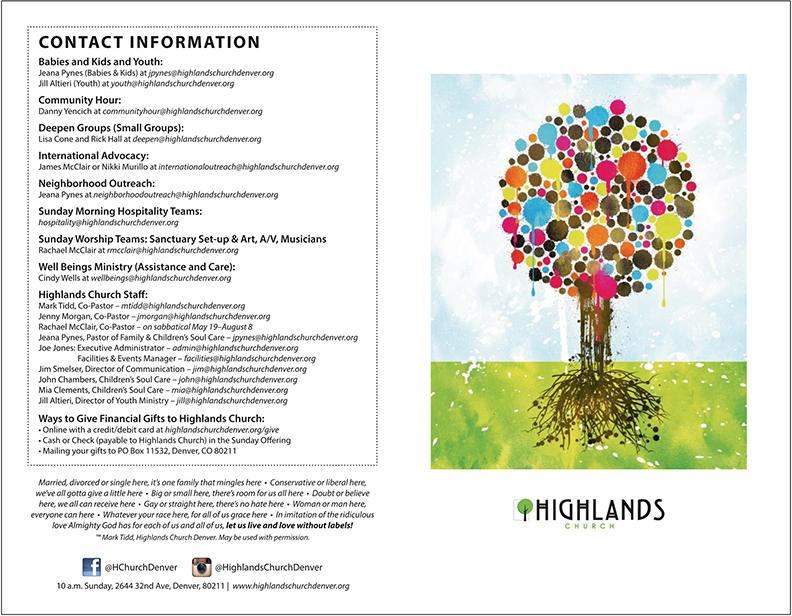 These are various message series and holiday looks designed for Highlands Church. 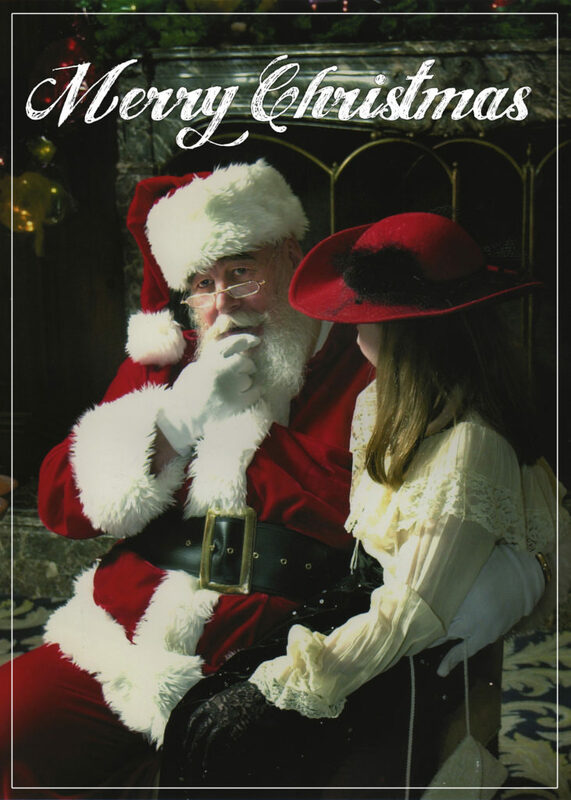 Various cards, flyers and invitations, etc. 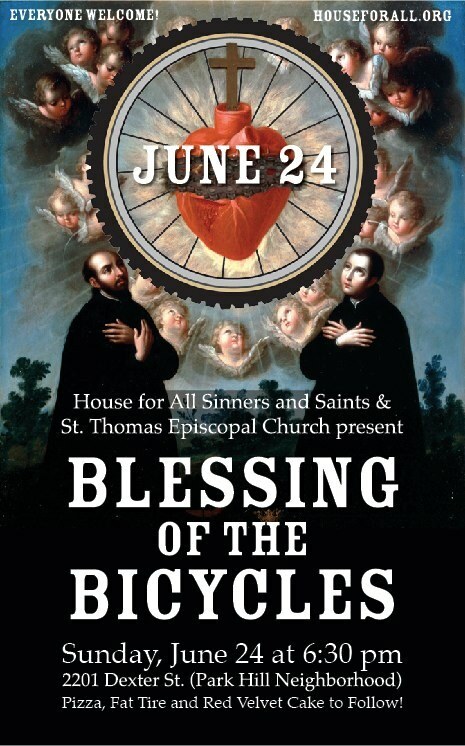 House for All Sinners & Saints is a progressive Lutheran church in Denver that I attend. They host several signature events throughout the year and I have designed the looks for these events. Here are several of the posters I've done. Here are several business cards I've designed for various clients. Here are a few logo designs I've created. 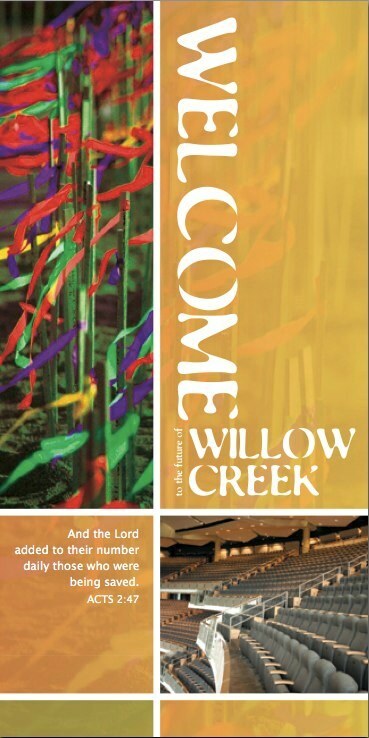 Willow Creek is a very large church of 20,000+ regular attenders. They opened a new 7,300 seat auditorium while I was working there. 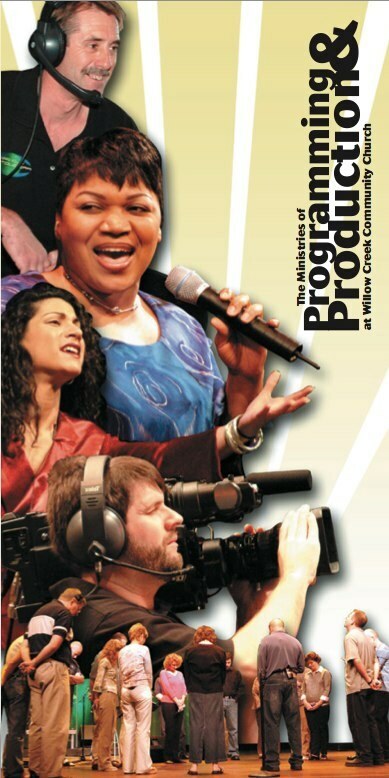 This is the booklet that I created that was handed out at the grand opening of that auditorium. This is a piece I created to generate volunteers for the sizable Programming and Production teams who perform and produce events at Willow Creek.